Secretariat was an American Thoroughbred racehorse, who in 1973 became the first U.S. Triple Crown champion in twenty-five years, setting new race records in two of the three events in the Series – the Kentucky Derby (1:59 2/5), and the Belmont Stakes (2:24) – records that still stand today. Secretariat was the son of Bold Ruler (a grandson of Nearco) out of Somethingroyal. He was foaled at Meadow Farm in Caroline County, Virginia. Like the equally famous horse Man o' War, Secretariat was a large chestnut colt and was given the same nickname, "Big Red." Owned by Penny Chenery (aka Penny Tweedy), he was trained by Canadian Lucien Laurin and mainly ridden by fellow Canadian jockey Ron Turcotte, along with apprentice jockey Paul Feliciano (first two races), and veteran Eddie Maple (last race). He raced in Penny Chenery's Meadow Stable's blue and white checkered colors and his groom was Eddie Sweat. Secretariat stood approximately 16 hands 2 inches tall, and weighed 1,175 pounds in his racing prime. The story of Secretariat began with the toss of a coin in 1968 between Christopher Chenery of Meadow Stables and Ogden Phipps of Wheatley Stable. The idea of a coin toss came from Phipps, the owner of Bold Ruler, and Bull Hancock of Claiborne Farms as a way to get the very best mares for Bold Ruler, and when the toss went their way, to add well-bred fillies to their own broodmare band. Bold Ruler was considered one of the important stallions of his time. He had a fine balance between speed and stamina, having had a frontrunning style but the stamina to go 1 1/4 miles; he finished 3rd in the 1957 Kentucky Derby. After his racing career, Bold Ruler was retired to Claiborne Farms but still was controlled by the Phipps family. This meant he would be bred to mainly Phipps' mares and not many of his offspring would find their way to the auction ring. Phipps and Hancock agreed to forgo a stud fee for Bold Ruler in exchange for getting to keep one of two foals produced by the mare he bred in successive seasons or two mares he bred in the same season. Who obtained which foal or even received first pick would be decided by a flip of a coin. On March 30, at 12:10 a.m., Somethingroyal foaled a bright red chestnut colt with three white socks and a star with a narrow blaze. By the time the colt was a yearling, he was still unnamed. Meadow Stables' secretary, Elizabeth Ham, had submitted 10 names to the Jockey Club, all of which were denied for various reasons. Approval finally came with the 11th submission, a name Ham herself picked from a previous career association, Secretariat. On July 4, 1972, Secretariat finished fourth, beaten 1 1/4 lengths, in his first race at Aqueduct Racetrack when he was impeded at the start, forced to take up on the backstretch and then could not make up the ground. After that loss, Secretariat then won 5 races in a row, including three important two-year-old stakes races, the Sanford Stakes and Hopeful Stakes at Saratoga Race Course, and the Futurity Stakes at Belmont Park. In the Hopeful, he made a huge move, passing 8 horses in 1/4 mile to take the lead and then drawing off to win by 5 lengths. He then ran in the Champagne Stakes at Belmont, where he finished first but was disqualified and placed second for bearing in and interfering with Stop the Music, who was declared the winner. Secretariat avenged that loss in the Laurel Futurity, winning by 8 lengths over Stop the Music, and completed his season with a win in the Garden State Futurity. Secretariat won the Eclipse Award for American Champion Two-Year-Old Male Horse, and, in a rare occurrence, two two-year-olds topped the balloting for 1972 American Horse of the Year honors with Secretariat edging out the filly, La Prevoyante. Secretariat received the votes of the Thoroughbred Racing Associations of North America and the Daily Racing Form, while La Prevoyante was chosen by the National Turf Writers Association. Only one horse since then, Favorite Trick in 1997, has won that award as a two-year-old. Secretariat started off his three-year-old year with an easy win in the Bay Shore Stakes at Aqueduct. In his next start, the Gotham Stakes, Secretariat led wire-to-wire for the first time in his career. He ran the first 3/4 of mile in 1:08 3/5 and finished the one mile race in 1:33 2/5, equalling the track record. However, in his next start, he finished third in the Wood Memorial to his stablemate Angle Light and Santa Anita Derby winner Sham, in their final prep race for the Kentucky Derby. Despite the loss in the Wood Memorial, Churchill Downs bettors made Secretariat the 3–2 favorite over Sham in the 1973 Kentucky Derby. Secretariat broke last but gradually moved up on the field in the backstretch, then overtook his rival Sham at the top of the stretch, pulling away to win the Derby by 2 1/2 lengths. Our Native finished in third place. On his way to a still-standing track record (1:59 2/5), he ran each quarter-mile segment faster than the one before it. The successive quarter-mile times were: 25 1/5, 24, 23 4/5, 23 2/5, and 23. This means he was still accelerating as of the final quarter-mile of the race. It would be 28 years before any other horse would win the Derby in less than 2 minutes (Monarchos in 2001). In the Preakness Stakes, Secretariat broke last but then made a huge, last-to-first move on the first turn. After reaching the lead with 5 1/2 furlongs to go, Secretariat was never challenged and won by 2½ lengths, again with Sham finishing second and Our Native third. The time of the race was controversial. The infield teletimer displayed a time of 1:55. The track's electronic timer had malfunctioned because of damage caused by members of the crowd crossing the track to reach the infield. The Pimlico Race Course clocker, E.T. McLean Jr., announced a hand time of 1:54 2/5. However, two Daily Racing Form clockers claimed the time was 1:53 2/5 which would have broken the track record (1:54 by Cañonero II). Tapes of Secretariat and Cañonero II were played side by side by CBS and Secretariat got to the finish line first on tape, though this is not a reliable method of timing a horse race. The Maryland Jockey Club, which managed the Pimlico racetrack and is responsible for maintaining Preakness records, discarded both the electronic and Daily Racing Form times and recognized 1:54 2/5 as the official time. However, the Daily Racing Form, for the first time in history, printed its own clocking of 1:53 2/5 next to the official time in the chart of the race. Subsequently, Tank's Prospect (1985), Louis Quatorze (1996), and Curlin (2007) have all run 1:53 2/5, equaling the time attributed to Secretariat by the Daily Racing Form. Farma Way won the 1991 Pimlico Special in 1:52 2/5, setting the current track record. As Secretariat prepared for the Belmont Stakes, he appeared on the covers of three national magazines, Time Magazine, Newsweek, and Sports Illustrated. He had become a national celebrity. Only four horses joined Secretariat for the June 9, 1973, running of the Belmont Stakes, including Sham, who had finished second in both the Derby and Preakness, along with three other horses thought to have little chance by the bettors, Twice A Prince, My Gallant, and Private Smiles. With so few horses in the race, and with Secretariat expected to win, no "show" bets were taken. Secretariat was sent off as a 1–10 favorite to win as a $2.20 payout on a $2 ticket and would pay at 20 cents more – $2.40 – to place. 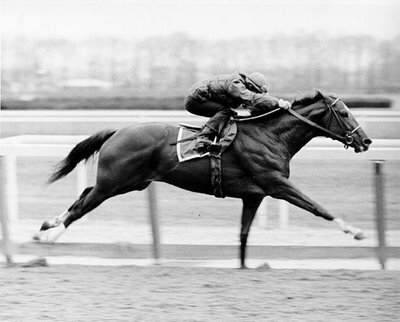 Before a crowd of 67,605, Secretariat and Sham set a fast early pace, opening ten lengths on the rest of the field. After the 6 furlong mark, Sham began to tire, ultimately finishing last. Secretariat astonished spectators by continuing on the fast pace and opening up a larger and larger margin on the field. In the stretch, Secretariat opened a 1/16 mile lead on the rest of the field. At the finish, he won by 31 lengths (breaking the margin-of-victory record set by Triple Crown winner Count Fleet, who won by 25 lengths) and ran the fastest 1½ miles on dirt in history, 2:24 flat, which broke the stakes record by more than 2 seconds. This works out to a speed of 37.5 mph for his entire performance. Secretariat's world record still stands, and in fact, no other horse has ever broken 2:25 for 1½ miles on dirt. If the Beyer Speed Figure calculation had been developed during that time, Andrew Beyer calculated that Secretariat would have earned a figure of 139, one of the highest figures he has ever assigned. Many bettors holding 5,617 winning parimutuel tickets on Secretariat never redeemed them, presumably keeping them as souvenirs (and they only paid $2.20 on a $2 bet). Secretariat became the first Triple Crown winner in 25 years and the 9th in history. Secretariat never duplicated his Belmont Stakes performance and never won another G1 race on dirt again, but continued to run impressively after the Triple Crown. He shipped to Chicago and easily won the Arlington Invitational at Arlington Park. He went to Saratoga, long known as the "graveyard of favorites", and succumbed to the jinx, losing the Whitney Stakes to the Allen Jerkens-trained Onion by a length. He then won the inaugural Marlboro Cup against a field that included Secretariat's stablemate, the 1972 Derby and Belmont Stakes winner Riva Ridge, top California stakes winner Cougar II, Canadian champion Kennedy Road, Onion, Travers winner Annihilate 'Em, and 1972 American Champion Three-Year-Old Male Horse, Key to the Mint. Secretariat ran 1:45 2/5 for 1? miles, a world record at the time. Secretariat suffered another loss to an Allen Jerkens trainee, Prove Out, by 4 1/2 lengths in the 1 1/2 mile Woodward Stakes in his next start. After failing on dirt in 2 of his last 3 races Secretariat then tried racing on turf for the first time in the Man O' War Stakes and won by five lengths over Tentam, setting a still standing track record time of 2:24 4/5. Secretariat's owner entered into a syndication deal that precluded the horse racing past age three. Accordingly, Secretariat's last race would be against older horses in the Canadian International Stakes at Woodbine Racetrack in Toronto, Canada. It would mark the second time in his career that he raced on grass and the first time he would be asked to go one and five-eighths miles. Secretariat won with another impressive performance. With jockey Ron Turcotte out with a five-day suspension, Eddie Maple rode Secretariat to victory by 6 1/2 lengths. Altogether, Secretariat won 16 of his 21 career races, with three seconds and one third, for an in the money finish in 20 of 21 starts, and total earnings of $1,316,808. Secretariat was again named Horse of the Year, as well as winning Eclipse Awards as the American Champion Three-Year-Old Male Horse and the American Champion Male Turf Horse. Part of his first crop at stud, Secretariat sired Canadian Bound who was the first Thoroughbred yearling racehorse ever to be sold for more than US$1 million. Sold at the 1976 Keeneland July sale, the auction bidding not only broke the $1 million barrier, but he ended up being sold for $1.5 million. Canadian Bound was a complete failure in racing and for several years, the value of Secretariat's offspring declined considerably. However, he eventually sired a number of major stakes winners, including 1986 Horse of the Year Lady's Secret, 1988 Preakness and Belmont Stakes winner Risen Star, and 1990 Melbourne Cup winner Kingston Rule, who broke the course record in Australia's richest race. He also sired General Assembly, who won the 1979 Travers Stakes at Saratoga while setting a still-standing race record of 2:00 flat. Andrew Beyer has said that General Assembly's speed figure in that race was one of the fastest in history. Like Secretariat in the Belmont, General Assembly never duplicated that performance in another race. There has been some criticism of Secretariat as a stallion, due in part to his perceived inability to produce offspring of his same caliber. His expensive syndication deal, perhaps, raised unrealistic expectations. Ultimately, he sired as many as 600 foals during his retirement. Though his blood flows through other notable racehorses---including (especially) 2004 Kentucky Derby and Preakness winner Smarty Jones, Secretariat turned out to be a noted broodmare sire, being the broodmare sire of 1992 Horse of the Year and successful sire A.P. Indy, Secretariat's grandson through his daughter Weekend Surprise, who was sired by another Triple Crown winner, Seattle Slew. AP Indy is the sire of 2007 Belmont Stakes winner Rags to Riches, the first filly to win at Belmont since 1905. Secretariat is also the dam-sire of the great stallions Storm Cat (by Storm Bird), through his daughter Terlingua, herself an excellent racemare, and of Gone West, through his daughter Secrettame. In the fall of 1989, Secretariat was afflicted with laminitis, a painful and often incurable hoof condition. When his condition failed to improve, he was euthanized on October 4 at the age of 19. Popular as a Triple Crown champion and in retirement alike, Secretariat was mourned by millions and buried at Claiborne Farm in Paris, Kentucky, given the rare honor of being buried whole; usually only the head, heart and hooves of a winning race horse are buried, the rest cremated. Post-mortem exam showed that his heart weighed 22 pounds, the largest ever recorded for a racehorse. On October 16, 1999, in the winner's circle at Keeneland Race Course in Lexington, the U.S. Postal Service honored the great horse, unveiling a 33-cent postage stamp with his image. ESPN listed Secretariat 35th of the 100 greatest athletes of the 20th century, the highest of three non-humans on the list (the other two were also racehorses: Man o' War at 84th and Citation at 97th ). Secretariat was inducted into the National Museum of Racing and Hall of Fame in 1974, the year following his Triple Crown. In 2005, Secretariat appeared once more in ESPN Classic's show Who's No. 1?. In the list of "Greatest Sports Performances" (by individual athletes), the horse was the only non-human on the list, his run at Belmont ranking second behind Wilt Chamberlain's 100-point game. On May 2, 2007 Secretariat was inducted in the Kentucky Athletic Hall of Fame, marking the first time an animal received this honor.